Linsheng – How To Preventive Maintenance: Industrial Air Compressor? linsheng emphasized that for air compressors, standard form of maintenance is never enough. To ensure smooth operation and avoid interruptions and unplanned downtime, a compressor maintenance plan must be in place to prevent – and not react to problems with the air compressor and all connected tools and machines. In small businesses, maintenance is a standard process that is equivalent to toner replenishment and software and hardware upgrades. Essentially, standard maintenance is the work you do on your device, and it stays in effect until it expires or is outdated by new technology. In facilities that use high-tech machinery, you must perform more than just standard maintenance to ensure the operability and longevity of all expensive equipment. For example, for an air compressor, you need to implement a preventive maintenance program to periodically check the compressor and its system peripherals to make sure everything is working optimally. The purpose of preventive maintenance is to discover mechanical problems before they spread and require expensive repairs and system downtime. Therefore, preventive maintenance involves checking all subsequent system components – some according to daily plans, others on a weekly, monthly, quarterly or yearly basis – to ensure everything is working properly. If you find the problem early, take steps to correct the problem. In some cases, preventive maintenance involves low-cost measures that help avoid low-cost situations. For example, when maintenance personnel notice a slight crack in the compressor belt, replace the belt and then help your company prevent the more expensive condition of the belt buckle, the compressor stops working, and when the staff tries to identify, the production stops working and Take the necessary steps to get the system back up and running. Regardless of the size or scope of your compressor operation, it is important to have staff or work with qualified service providers to monitor preventive maintenance work in a timely and consistent timeframe. Only through preventive maintenance can you ensure that the machine is working every hour, every day, and continues to its life expectancy. One of the most important benefits of air compressor maintenance is that it enables smooth, efficient operation and reduces system downtime. Anyone who operates an air compressor facility knows that downtime can be a very expensive problem because it stops production when the machine is not working. Companies that fail to develop maintenance agreements in a timely manner may experience performance issues more frequently. This situation is difficult to predict, but may occur at the worst of times, such as high-cost production before the set deadline. To be on the safe side, you need to perform maintenance on a schedule without having to skip the date, even on days when everything seems to be running perfectly and you don’t see any problems that might arise. You can save money by reducing downtime and part failures in your air compressor system. So you can profit in two ways – by increasing productivity and reducing overhead. The savings from timely compressor maintenance allow you to invest more in better equipment as your market enters the market. If maintenance is not performed, the costs involved in servicing the air compressor and its surrounding components may account for a significant portion of the company’s annual revenue. When you do a timely maintenance, you get the savings you can pass to your company with higher wages and cheaper products. When you perform air compressor maintenance on a regular basis, it allows you to capture instances of over-application of features in the system or difficulties in maintaining expected productivity. When such problems occur, they usually need to be cleaned, replaced or lubricated. By discovering these problems before they go out of control, the machine runs more smoothly and efficiently, saving energy. Of course, saving energy can also save your overall production costs. With lower energy costs per month, you can invest your money in the company’s infrastructure. Of course, the biggest benefit of air compressor maintenance is that it increases the life and efficiency of the machine itself and the entire system. When you add up the initial investment cost of an air compressor and all additional pneumatic tools, you want to ensure a return on investment with years of best performance. Ideally, the money you spend on the compressor system should reward you thousands of times through productivity. If maintenance is not performed, the air compressor and its peripheral components will not be regularly inspected, adjusted and cleaned. When you compare the profit of a company that implements responsible system maintenance with the profits of a company that does not implement system maintenance, you may find significant differences in productivity. On industrial air compressors, preventive maintenance is critical to ensuring the functionality of the system and its various accessories. The key components to be inspected include filters, vents, belts and bearings, all of which can cause problems for the system if dirt and dirt build up. In addition, you must apply and reapply the lubricant on all applicable parts of the air compressor in a timely manner. 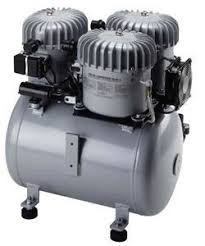 The purpose of the air compressor is to produce clean, pure, compressed air that ultimately powers many functions. To ensure the ultimate air quality, the ambient air entering the compressor must be filtered before leaving the machine. Without a clean air filter, this is impossible. If the air filter becomes dirty, impurities and particulate matter can damage the compressed air and reduce the quality of the end application. Therefore, please clean the air filter regularly. Change regularly, depending on the environment. If compressed air passes through the system and is shipped to the end of the application, the oil will reduce the quality of the compressed air. Some of the most affected processes will include pneumatic sprayers, air purifiers, and any other oil that could damage the surface. Therefore, it is important to ensure that oil is removed from the compressed air when present in the system before it leaves the machine. Check the oil filter every week, whether the compressor is lubricated or not. Also, replace the oil filter at the recommended intervals, depending on your equipment, for a range of 4,000 to 8,000 hours. If the oil filter is seriously damaged by oil before this, please replace it as soon as possible. Lubricants are one of the most important elements in air compressor function. Lubricant provides smooth, non-corrosive motion on all internal metal parts and fittings. In the absence of lubrication, tension occurs between the contacting metal surfaces, which causes corrosion of the components and joints. Once the corrosion is ripe, the rust will spread and feed through certain mechanical parts. However, even if a lubricant is present, if it becomes too old, it loses its viscosity and becomes corrosive. Check the lubricant level daily to ensure the health of the air compressor. Every three to six months, wipe off the old lubricant and reapply a new coat. Always replace the separator element each time you change the lubricant. For motor operation, the bearings must be properly lubricated. The tiny metal balls constantly roll toward each other and roll against the inner wall of the circular outer casing. Therefore, the bearings may rust if not properly lubricated. If it rusts, the bearing will gradually slow down and eventually get stuck in place. When this happens, the motor will malfunction. To protect the health and performance of the air compressor motor, the bearings are lubricated every 4000 hours. Always check the bearings quarterly between each lubrication to ensure they remain adequately lubricated. For the internal movement of the air compressor, it is important that the belt has the proper tension. The rubber of each belt must also be strong but flexible to ensure balanced movement between the pulleys of the connecting parts. However, over time, the rubber on the belt will inevitably wear and rupture in some places. Therefore, it is critical to replace the belt before the belt loses tension, or worse, to engage during operation. Check the belts once a week to make sure they are not worn. Adjust the tension if necessary and replace each belt after wear. Air compressors have the magical ability to convert ambient air into a powerful machine that can effectively power a heavy machine. In other words, the compressor itself can only do a lot of things to turn ordinary air into something powerful. Although the function of the internal components is to purify the air for end use, if the air intake is full of dirt and dirt, the work is more difficult for the machine to perform. To ensure that the incoming air is as clean as possible and to prevent dust from being drawn into the system, check the air inlets weekly and clean if necessary. Check the air compressor for signs of oil or air leakage. Also check the pneumatic hose for leaks, because the leakage seriously reduces the efficiency of the air compressor. Also, make sure the cooler is free of dirt. When making an air compressor preventive maintenance checklist, you first need to consider the type of compressor involved. Most compressors require preventive maintenance for each system component, ranging from daily to yearly. Daily: Perform the following steps daily or after eight hours of use. Check the lubricant level to make sure it is not below the middle of the bayonet gauge. If the lubricant is discolored, empty it and refill it. Empty water coming out of the receiving tank. Visually inspect the compressor and verify that the safety measures are in place. Check for leaks and vibrations. Weekly: Perform the following steps weekly or after 40 hours of use. Clean the surface of the compressor and intercooler. Check the compressor and hose for leaks. Clean the air intake filter. When the weather is wet or the environment is dusty, please perform the above steps twice a week or every 20 hours. Monthly: Check the belt tension in the air compressor every month or after every 160 hours of use. Quarterly: After every three months or every 500 hours of use, perform the following steps. Check the oil filter and, if applicable, replace the oil filter. Check the torque on the pulley nut and the screw. Replacing the Lubricant – If the lubricant is a synthetic lubricant, this step also applies for twice the duration of a conventional lubricant. Check the valve for leaks or carbon footprints. Clean the filter of the crankcase. Check motor area contact points and pressure switch diaphragms. Daily: Perform the following tasks daily or after eight hours of use. Monitor all meters and indicators to ensure proper operation. Observe abnormal noise or vibration. Drain water from the air/fluid reservoir. Monthly: Perform the following operations every four weeks. Repair the air filter as needed. If there is a very dirty situation, this should be a daily or weekly task. Clean the aftercooler and the closed cooler heatsink for air-cooled installations only. Wipe the entire unit to maintain its appearance. Every six months: Perform these tasks every six months or after every 1000 hours of use. Regular/annual: These tasks are completed annually. Cross the unit and check that all bolts are tight. Test the pressure relief valve for proper operation. Check the safety (HAT) shutdown system. Check the reading on the display. Check if the condensate is drained during operation. Manually drain condensate (if applicable). Every three months: every three months, or after 500 hours of operation, do the following. Check (optional) the pressure drop across the filter. Check the air inlet filter: check for cleanliness and damage. Replace the dirty or damaged filter with a new one. Check the cooler. Clean with air jets if necessary. On a compressor with an integrated dryer, brush or blow the fin surface of the condenser. Check and clean the electronic drain. Regular/annual: Perform these tasks annually. Replace the air inlet filter. There are temperature protection and motor overload tests. Check the tension and condition of the V-belt. What maintenance checks should the technician perform? If you do not have a qualified staff to operate your compressed air system. When a mechanical failure occurs. When you hire professionals to perform these and other time-consuming and potentially dangerous tasks, it can help you save time and money and ensure that your work is done correctly. In addition, professional maintenance ensures maximum safety in the more difficult aspects of the work. To ensure the highest efficiency and absolute shortest downtime and maintenance costs for your air compressors, linsheng recommends that you complete the preventive maintenance checklist task in accordance with the established schedule. Maintenance is performed daily, weekly, monthly, quarterly or annually, depending on the needs of a given component. When you perform preventive maintenance according to the checklist, your air compressor and its accessories will last longer and be more efficient. Preventive maintenance can detect problems early before serious damage to the system and result in costly repairs and downtime. You can put the savings from budget maintenance into your company’s infrastructure and employees.